LONDON--(BUSINESS WIRE)--Technavio’s latest market research report on the global multi-factor authentication market provides an analysis of the most important trends expected to impact the market outlook from 2017-2021. Technavio defines an emerging trend as a factor that has the potential to significantly impact the market and contribute to its growth or decline. The global multi-factor authentication services market is expected to grow at a CAGR of close to 23% during the forecast period. Enterprises are adopting safe and secure authentication services that allow only an authorized person to access their information. Out-of-band (OOB) authentication helps end-users to prevent fraud. It works using a secured communication channel. Enterprises are adopting OOB technology for high-risk transactions to verify the identity of the user and authenticate for both financial and non-financial transactions. OOB authentication makes use of two different networks working together to identify a user. OOB authentication technology is a kind of multi-factor authentication. This technology works well in a situation when any hacker gains security credentials to the account of a user. It will not surpass without access to the second authentication network. The OOB authentication method is cheaper to deploy compared with keys and other complex biometric technologies. Hardware OOB authentication tokens and mobile phone-based OOB authentication tokens, such as SMS and back-up calls, are the available OOB authentication methods. The rise in maintenance costs for hardware and software-based two-factor and three-factor authentication models has aroused the interest of many companies in the adoption of cloud-based multi-factor authentication solutions. Vendors are integrating multi-factor authentication techniques with cloud due to the growing demand for cloud-based multi-factor authentication. Companies prefer cloud-based multi-factor authentication because of its benefits like easy installation and upgrading, pay-as-you-go, zero maintenance costs, less dependency on internal IT personnel, and improved reliability and scalability. Cloud-based multi-factor authentication offers secure access to networks and applications, protects users while improving user experience, and addresses compliance requirements for the security of regulated data. The global multi-factor authentication market comprises of software and hardware authentication solutions. Some of the cost-conscious organizations have shifted to the use of software authentication methods. Certain government organizations still use the hardware authentication method. This has prompted vendors to introduce a unified platform that can provide both hardware and software authentication solutions. “Unified platforms for authentication will reduce the costs involved in maintaining separate platforms and modules. They will also enable users to switch easily to other authentication solutions. Unified platforms are penetrating the global multi-factor authentication market,” says Amrita. 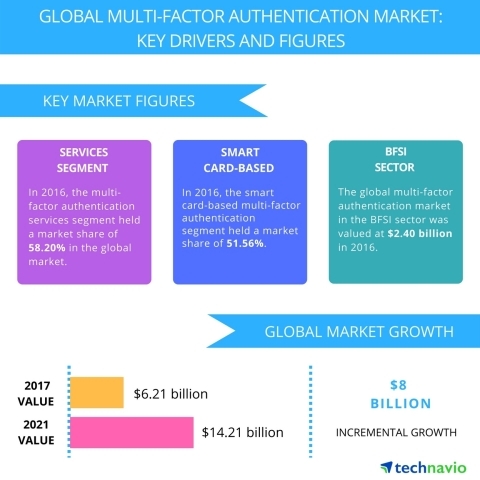 Technavio’s report on the global multi-factor authentication market provides an analysis of the key trends expected to impact market outlook.